With full colour designs printed on either one or both sides of flags, advertising is simple! 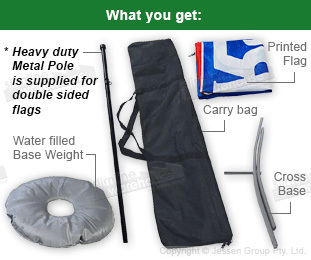 This portable flag has a carrying bag included that holds all of the components for transport between events, and also helps keep the banner safe from gathering grime in between uses. The outdoor banner displays are also able to be used at indoor events like trade shows, or outside of retail stores, restaurants, and other businesses in shopping centres! 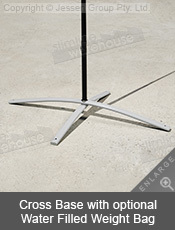 The included cross base makes it easy to place the flag pole onto any surface, with the water bag helping to stabilise the stand for use in public areas or different weather conditions. The portable flag, like feather flags, have digital printing onto woven polyester fabric that shows you custom designs in full colour to help draw attention to the 1.8m tall flags. 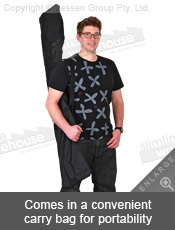 There is both single and dual-sided printing offered with your purchase. The single-sided print has a reverse print on the back of the flag, and the dual-sided print has two flags sewn together to show the same design to all directions! 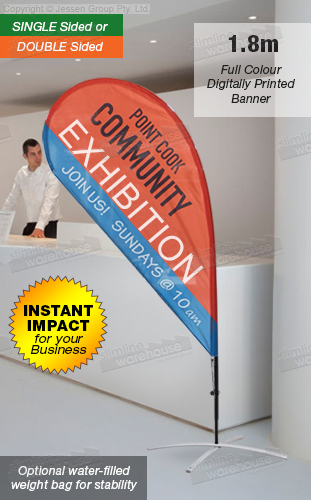 The easy to set-up banner displays require no tools for assembly, using a collapsible pole that is made from fiberglass for single-sided versions, and metal for flags with dual-sided printing. With hundreds of different products to choose from in a wide variety of categories, our online catalogue is your best bet online to find exactly what you need to outfit your business in style without breaking the bank. 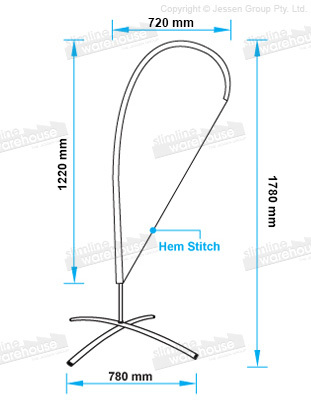 Slimline Warehouse is a national leader with many different products to choose from in heaps of categories, building a reputation of offering only quality products at low prices in for over 25 years in the business. Order now for your business in Perth, Sunshine Coast, Melbourne, Sydney, Canberra, Brisbane, Sunshine Coast, Adelaide, Hobart, Wollongong, Alice Springs, & anywhere else in Australia! Pole: Fiberglass for single sided, metal pole for double sided.